Manila, Philippines (Updated June 15, 2018) – The complete result and list of passers for ALS A&E March 2018 or the Alternative Learning System Accreditation and Equivalency Test for SY 2017-2018 (Elementary and Secondary levels) are expected to be released by the Department of Education (DepEd) through the Bureau of Education Assessment (BEA) three (3) months after the exams. 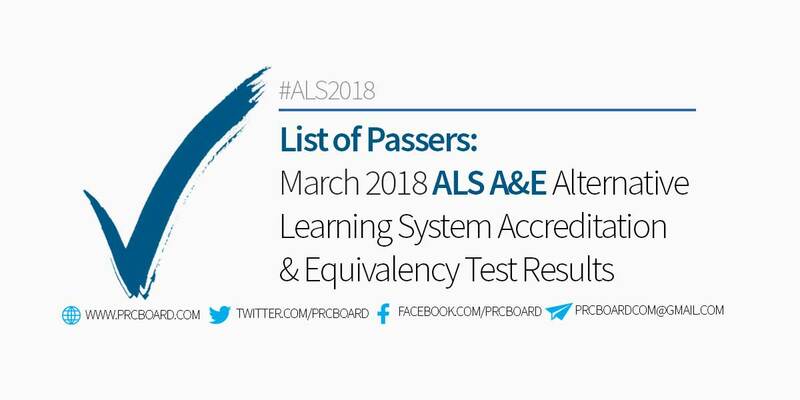 The 2018 ALS A&E exams were administered by BEA on March 4, 2018 at Luzon cluster and March 11, 2018 at Visayas and Mindanao clusters. As per Memorandum No. 006 series of 2018, DepEd and BEA will release the results not more than three (3) months after the administration of exams or by June 11-15, 2018. However, results may also be released earlier or later than the target dates without prior notice. Relative to DepEd Memorandum No. 076, s. 2018 entitled Change in the Passing Score of the 2016 Accreditation and Equivalency Test from 75% to 60%, the Department of Education (DepEd), through Bureau of Education Assessment (BEA), announces that the 60% passing score of the Accreditation & Equivalency (A&E) Test remains in effect. Alternative Learning System is a free-education system given by the government which provides option for the dedicated students to finish their studies through non-formal and informal sources of knowledge and skills. A&E Test are open for learners in the ALS and Non formal education programs, out-of-school children who are prepared for the assessment and adults who are seeking for Certificate of Learning. Applicants shall be at least 12 years old for Elementary Level and 16 years old for Junior High School. Successful examinees of the test will be given a Certificate or Diploma with the seal of DepEd and and signature of the Secretary. The certificate certifies that the competencies are comparable to graduates of the formal education system. In the latest press release of DepEd, they said that A&E completers now have lot of options after passing and acquiring the certification. Passers may enroll at university of his/her choice subject to the requirements of the Higher Education Institution (HEI), he/she will also be eligible to enroll at TESDA programs and other government and private skills training institutions. Likewise, Deped said that A&E passers have the option to enroll as Grade 11 in any public or recognized private institutions offering SHS programs. Should the examinees wants to clarify something, they can reach the BEA office directly at 3/F Bonifacio Bldg., DepEd Complex, Meralco Ave., Pasig City from Monday to Friday or call them at their hotline numbers at (02) 631-2591 or 631-2589. To receive up-to-date news on ALS Result for March 2018 – Elementary and Secondary, we advise our visitors to bookmark this page, visit DepEd official website, follow us at our social media pages via Facebook and Twitter or join the members discussions at our Facebook Group. Good pm po. Maitatanong ko lang po,kung naka pasa po ako. Complete name ko po ay Lucia Pandita Bagit. Salamat po. good pm po.. anong oras po ba lalabas ang result ng als secondary..
Matatapos na po ang araw na to bkit wala pa din result? Kailan po release ng Result? Ask k lng po bakit kpag ng inetial registration ung payment options wala na ung gcash? ask ko lang po kung naka pasaba si marife bautista torreon. Good pm ask ko lang po kung nakapasa po ako? Nakme ko po. Jeremias A. Mabignay, as secondary level po thank you po. NCR March 4 taker po ako. Gud pm po mam/sir,tanong lng po kung nakapasa po ang pamangkin ko, chona capangpangan. Maraming salamat po. Pwede amg tanung? kung naka pasa ba ako sa test ng ALS? Barcoma, Gabriel po? Good day maam/sir Praise be Jesus and Mary! Nakapasa po ba sa Secondary Vienne Alyssa B. Pajaro? NGHANU WALA PAMAN ANG RTESULT ..DLI NAMI MADAWAT PAG ENDROLL..HAHAHAY PAASA MAN UY..
Cyryll Joanne Detablan and Gleszie Joy Detablan na ka pasa kaya kami? Good morning po. Tanong lang po kung nakapasa si felicity angelie papa po? hello po tanong ko po sana kung nakapasa po ba ako? JUNE 16 NA PO! WALAPA DIN PO BANG RESULTTTTT? ANG SABI NIYO JUNE 11-14 TAS jUNE 15 ? ANO NANGYARE? BUMAGAL ATA SISTEMA AHH ?. D MAKA PAG ENROLL UNG KAPATID KO SA GRADE 11 KASI WALA PAUNG RESULT NG EXAM NIYA. Good day po,tatanong ko lang po kung nkapasa po ako,nag exam po ako last March 6 this year,Janela San Antonio po complete name ko thank you po..
Goodmorning po.. Please check din sa akin if nakapasa po ba ako COMPLETE NAME: ANGELICA C. BANDOLON FROM: IPIL ZAMBOANGA SIBUGAY REGION 1X. THANK YOU. Good pm po. Maitatanong ko lang po,kung naka pasa po ako. Complete name ko po ay SALLY SAGRANADA BUSTILLO. Salamat po. Good day. Bakit wala pa pon results sa region XI? mag-i-enroll na sana kapatid ko for college, pero wala pa rin hanggang ngayon kasi wala maipresent na ALS Result. Nakakawalang gana magaral dahil s matagal na posting. Kawawa yung kapatid ko,araw-araw ino-open ang site ng ALS para makita result. Naway may tumugon. where to find po ung full result?? Pwese ba ako mag tanong???? Hello po may tatanong po ako naka pasa ba c maryflor cuyos labonite. Pls reply. Ask ko lng po if nkapasa ako Aiza Jamito Bungo po Daet.Vamatines norte po on november po ako nagexam?? Good pm. Ask lang po kung nakapasa po Si Robert S. Lacro jr.?